Here's another woofing dog t-shirt that I haven't uploaded on here before. Remember bisecting angles using Euclidean geometry at school? (That's when you had to use a pair of compasses and a ruler to divide the angle exactly into two.) Well, it's impossible to TRISECT an angle using the same techniques. And so I thought I'd design a t-shirt in homage to this fact. I've very nice. I own one myself. I wear it frequently. Sometimes I sleep in it. 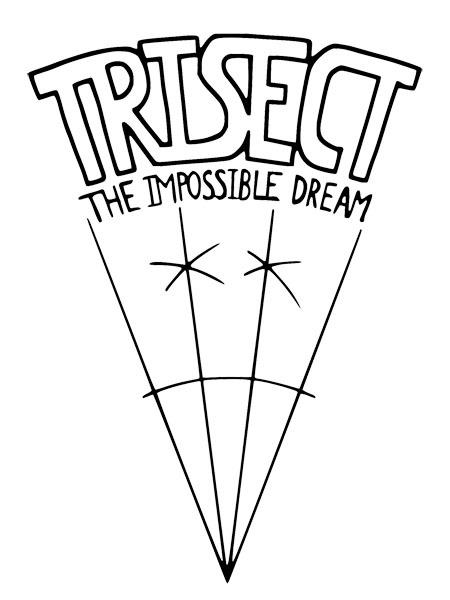 'Trisect: The Impossible Dream' t-shirts and accessories at the Woofing Dog Shop! Link of the Day: It is, however, possible to trisect an angle using origami.